"It takes a long time for a character to become who they are," said Mo Willems, the creator the Pigeon, Trixie and Knuffle Bunny, and Leonardo the Terrible Monster. "While I am working on a book with one set of characters. I am thinking about and doodling another set." 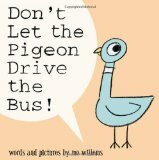 With these wonderful characters Mo Willems has been awarded three Caldecott Honors (Don't Let Pigeon Drive the Bus 2004, Knuffle Bunny 2005, Knuffle Bunny Too 2008). More recently, he has received three Theodor Geisel Award recognitions for his Elephant and Piggie books (There is Bird on Your Head 2008, Are You Ready to Play Outside 2009, We Are in a Book 2011- Honor). We're not suppose to tell the pigeon but "Elephant and Piggie are his favorite books to make." (Pigeon Presents). Before our birthday celebration this week for Mo we had read all the Knuffle Bunny books and many of the Pigeon books. However, we had never read any of the Elephant and Piggie books. Please don't tell the pigeon (or Trixie for that matter) but, "Elephant and Piggie are now our favorite books by Mo Willems to read!" My wife often says to me after she puts the baby to bed, "I can hear you read books all the way downstairs!" (Whoops!) Well, what can I say, I get into the books I read. After reading the Elephant and Piggie books I am surprised I didn't get a call from my neighbors! They are wonderful read alouds! I had a blast reading the words of Gerald the elephant each night. One evening, after the kids were in bed, I had a thought...."The Elephant Hat!" I knew my wife had an elephant hat at school that the teachers all wore for Halloween. I thought it would fun for the kids to have the elephant hat and a pig nose to act out the stories of Piggie and Gerald. Then, inspiration struck after reading four Elephant and Piggie books one afternoon this week. My daughter and I wrote our own skit based upon our favorite characters by Mo Willems. We call the skit, "Guess Whose Birthday?" We hope you enjoy! Happy Birthday Mo Willems! I don't know why I'm now just realizing this, but your house must be one of the funnest places ever, especially for kiddos! You are constantly having "birthday parties". I mean, it really doesn't get much better than that! Oh my goodness! This is terrific!!! Welcome to Read Aloud Thursday! I look forward to browsing around your blog! Wow Eric, that was awesome! Great stuff as always! I've already "I Love My New Toy" about 6 times this morning with my daughter. PS...Mo tweeted to YOU! How exciting! :oD Ahhhhh!! !